This learning is part of the child’s evolutionary process and cannot force. But your work as parents, encouraging and stimulating the child, is fundamental to favor it. At three years of age, a child has a vocabulary of between 900 and 1,200 different words, which can be combined to make compound sentences. But until we get here the way is long, and in it, the parents have the floor. The child learns to talk if he surrounded by people who speak to him. The stimulus becomes, in this way, the engine of this process. The higher the degree of motivation that parents transmit, the faster and more effective their learning will be. The beginning of language is essential for a child because he learns what expected of him, what he has to wait for others. And learn to behave in each situation according to these references. It allows the adaptation to the medium and the acquisition of its first values and opinions. In the evolution of the language one can speak of two great stages: the Prelinguistic, until the two years of age, and the verbal, from the two years. Many children love to talk, even those who say only a few words. For the little ones, talking is not only fun, but it also helps them to develop their communicative skills. How can you motivate your child to talk to you and encourage his or her interest? Here are six tips. For a little boy, every day is an adventure. Take advantage of any event you do with your child to talk about it (go to the supermarket, wash the car or dry cleaners). Encourage to ask you questions about any doubts you may have. Before you go to bed at night, talk about what you did during the day. If your child’s answers are super short (two words, for example), try asking specific questions to give you more details. Let’s say your kid told you he went to the park. Motivate him to say to you more, with questions like the following: “Who took you to the park?”, “Who did you play with?”, “What game did you like best?”. When you think about your questions, try to make the answers go beyond a yes or no. Remembering and talking about what happened on the day can be very helpful for parents whose children go to a child care center. That helps them stay up to date with their children’s activities. After reading a hundred times your child’s favorite book, do not be surprised to know it by heart. 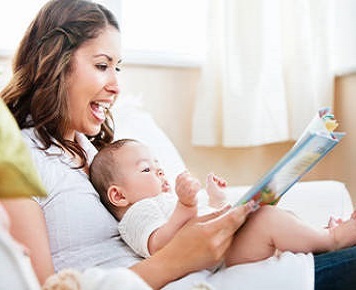 One way to encourage him to practice his developing verbal skills is to pause while reading his favorite books for him to complete the phrase. If your little one needs help, give him some clue. If you tell her the missing word, ask her to repeat it after she hears it. That will allow you to practice the pronunciation of new words. Talking will be a lot more fun for your child when it becomes a game. When you are anywhere (a coffee, the airport, the supermarket, etc.) play to discover things (ask each other “what is this?”). Point to all kinds of objects and ask your child to say the correct name. To not thwart, start with a couple of things you already know (a car, a cat or an apple, for example). Then, occasionally, he points to some object that is new to him. If you don’t know the word, dísela it in your ear and let it repeat it aloud. Describe the purpose and explain how it works. (“This is called an umbrella, and we use it on our heads when it rains not to get wet”). More toddlers children like games a little more difficult. One you can prove is to ask your child “What happens next?” Start telling her a story, and when you’re in the most exciting part of history, ask her to describe what happens next. If your child still does not have the verbal skills to give you a lot of details about the story, you can ask him some fundamental questions to help him. Most children develop a fascination with phones long before they can say a word. That can help you encourage your child to talk. When you receive calls from a family member or friends, give the phone to your child so that he or she can stimulate verbal contact with other people. Try not to make video calls so that your child does not use visual cues to help him or she communicates. That will help him to perfect his pronunciation. If you notice that you are starting to feel frustrated, it is advisable to help you express what the child is trying to say. Do not think that children are not motivated to talk to adult people. Your baby can understand more than you think. If you and your partner talk about the color the playroom will have, for example, ask your child (“What color would you like?” or “What color would you like to paint the walls of the room?”). Although you’re unlikely to end up painting the walls of your child’s favorite color (bright red), it’s good to give your opinion. Most kids love to film. Tell him you’re shooting him to see how he reacts. Some children will start their show right away, while others need to orient them a little bit about what to do in front of the camera. If your child has a favorite song, ask him or her to sing it.